Welcome to the Calhoun-Mania Funeral Home, formerly the Collins Calhoun Funeral Home, originally founded in Rutherford by John T. Collins in 1884 at the young age of 17. For over 134 years our funeral home has been following Mr. Collins and Mr. Walter Calhoun's principles of integrity and compassion, along with personal and affordable services to our families of Rutherford and surrounding communities. We continue offering our families an individualized ceremony that is dignified and tailored to meet every family's special needs, customs, and budget. We take pride in maintaining beautiful landscaped grounds, a comfortable setting with tastefully updated interior of highest standards to ensure a respectable and caring environment for our families and their guests. Whether you are contemplating a cremation service, a traditional funeral ceremony or a pre-arranged service, our team of compassionate professionals pledge to help arrange and carry out the service exactly the way you would like it to be. As a family-owned and operated funeral home, we are committed to the unparalleled attention to detail including updated technology for exceptional service, something you should always expect and deserve. For your convenience... We offer ample and safe "on street" parking and "behind" the funeral home parking with a Back door and Side door entrance. On street parking in front is meter free. Our front entrance is Handicap accessable, with a designated space and "Handicap" sign identifing it as a Handicap Only parking space. If you or someone you know needs assistance upon entering the building due to having special needs, just call ahead or alert our concierge in the lobby when you arrive. Any guests in need will be assisted into our funeral home with care and dignity. All are welcome to stop by for a visit, have a cup of coffee and cookies and chat with our staff, take a look around, and ask any questions you may have. Our goal is to bring comfort to you through understanding, information and trust to take the fear out of the funeral process. We are just one family helping another family. Dear Angelo & Debra, We want to thank you for everything you did for our family.You made our mom look beautiful & at peace. You both were so thoughtful, kind & caring.You made us feel as if you were part of our family & we were part of yours! We are very grateful. Dear Angelo & Debra, Thank you so much for your help when our sister Kathy died. We were so blown away by the support you gave. Healing from this has been very hard for all of us. thank you for your kind, compassionate & most professional service. Kathy looked like an angel! Please extend our thanks to your staff for their help as well. Dear Debra, It's been several months since I've seen you but I still wanted to thank you and let you for taking the time to speak to me about the passing of Blanche(Larkin).I really do miss her. When I left,on my drive home I felt a sense of calmness as if she wanted me to find her Again.I let the dancers know of her passing. thank you for the prayer card. It was very generous of you to give me your last one, It's very special to me. I will never forget your helping me to find my friend Blanche. When tragedy strikes, you need people who know what to do and get it done with compassion. That's what we found here. The fairness and tenderness of Angelo & Debra Mania & staff gave us the strength to do the right things for our departed son. But, it was the little kindnesses & complete competence that made this outstanding. When one of our party had their glasses break, Debra fixed them and even returned the cleaned. Just what you need during a time like this, Exemplary service. Recently, your Funeral Home took care of a funeral for my brother. We could not have asked for better care and professionalism. But beyond that, the attention to detail went way beyond any expectations we could have had. Everyone was compassionate and ready to accommodate our family with whatever we needed. Some things we never even thought of, but were just quietly taken care of by you. 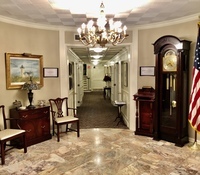 The funeral home is beautiful and well maintained, so we were proud to have people visit. We felt like we were in a beautiful home with everything done for us. Thank you Angelo and Debra, along with wonderful your caring staff for turning a very sad & difficult situation into a beautiful and meaningful ceremony. Our 5th Annual Christmas Memorial Ceremony was held on Saturday, December 3rd, 2016. We were pleased to host this special Ceremony for families & friends who lost a loved one during the year. We started this Ceremony 5 years ago, hoping to give something meaningful back to grieving families we had come to know and care for during the Funeral Services. Those who attended over the years trusted us once again, to join us with their family members and friends to memorialize and celebrate their loved one or someone close to them. Some return each year just to be with neighbors and friends, which is so touching to us. We know that the Holidays and the socializing that comes with it can be very difficult or something you just wish you can avoid. You are not alone; we have all experienced these feelings. Some admitted that they were reluctant to come; it actually took a lot for them to come, especially back to a Funeral Home. But, they were so grateful that they did.... it helped. In fact,families asked us to please continue this tradition for other families. The Ceremony included some brief words from local Clergy, a spiritualist, live music, a Christmas Tree Lighting and Blessing with personalized ornaments which were placed on our tree for the ceremony and taken home as a gift. We also offered the invitation to our families who knew of a neighbor or friend who lost someone during the year in our community who may not have come to us and were unaware of our Ceremony; but, who thought it might help them, too. Our doors are open to all of our friends and neighbors. Sincerely, Debra and Angelo PS: The families who lost a loved one the end of 2016 will receive an invitation for December 9th, 2017. To honor the Veterans of Rutherford and the surrounding community, a flag pole was installed in front of our Funeral Home on Monday, Nov.11th 2011. As we proudly display the American flag each day, we are always reminded of our brave and devoted servicemen and women around the world who protect and defend our freedom. A flag representing a Veterans branch of service will also be displayed along with our Flag in recognition of their dedicated service, as they leave their loved ones and friends behind. Thank you to all of our Veterans for your service and for protecting the United States of America!